Cabot Guns, known widely as the Rolls Royce of 1911 pistols, have melded the spirit of the ancient Damascene swordsmiths with the peerless craftsmanship of modern artisans to create four truly unique firearms. Forged from the brilliant mind of master blacksmith Robert Eggerling, we are proud to present the latest addition to the Cabot Guns Oak Collection: The Mosaic Damascus 1911. The heart of these beautifully designed pistols is one-of-a-kind, hand-forged, Eggerling Mosaic Damascus steel. Made from a unique blend of carbon steels and nickel, Eggerling Mosaic Damascus is coveted by high-end manufacturers around the world. And like any gifted artist, Mr. Eggerling not only sees patterns and evolves new techniques that mere mortals can’t begin to conceive, he has the rare ability to quilt together steels with a virtuoso’s touch. Eggerling literally transforms his inner thoughts into steel, as a painter would to canvas. And yet, creating a single Damascus billet large enough for multiple weapons is an extraordinary accomplishment few blacksmiths achieve. 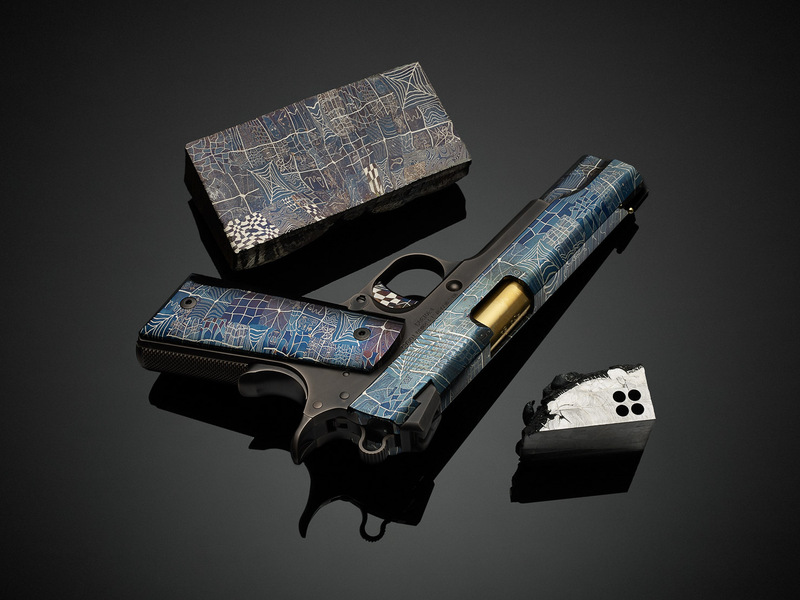 For Cabot, Mr. Eggerling succeeded, forging an exclusive pattern into a single billet of Mosaic Damascus – enough to manufacture four custom pistols. 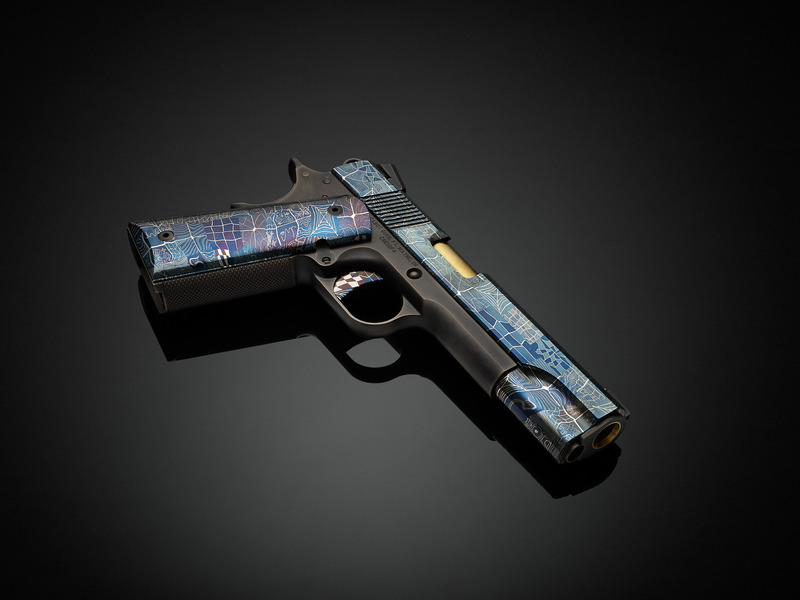 And thus, the Mosaic Damascus 1911 was born. Your hands form shapes your will defines. Apply the fire and let hammer fall. Discover the colors your efforts do fetch. Incorporated into masterpieces; cherished by those of Earth. Perhaps fittingly, crafting guns from an ingot of this precious material is quite difficult; near-alchemy, in fact. Cabot craftsmen had to learn and develop cutting and finishing properties required specifically for this unique material. So complex is this process that the construction of the pistols required more than a year to complete. 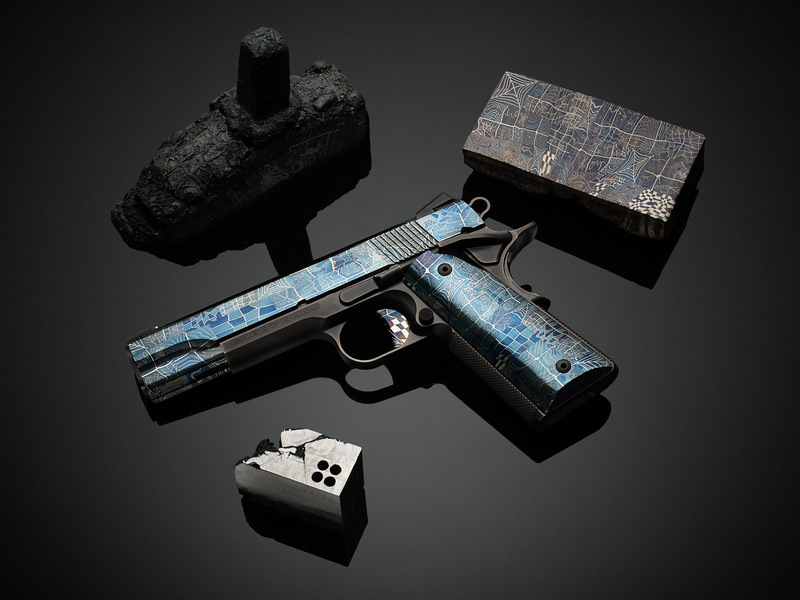 These four Mosaic Damascus 1911 pistols are among the finest work Cabot has undertaken. It was truly a journey to produce these and we are thrilled with the outcome. The Mosaic Damascus 1911: Imagination transformed into metal.